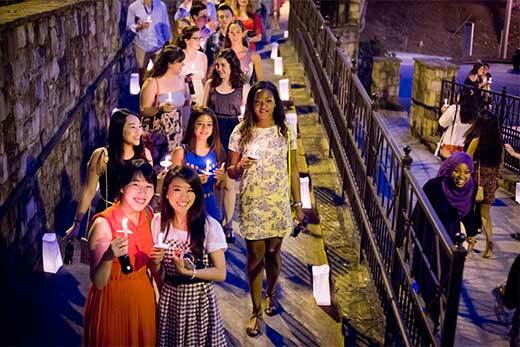 Commencement Weekend traditions like the Candlelight Crossover, held this year on May 7, mark the transition of Emory students into Emory alumni. The Emory Alumni Association offers a broad range of benefits and services to graduates. During Commencement, excited collegians come together on Emory's Quadrangle to make the formal transition from student status to that of degreed alumni. The Emory Alumni Association knows that life as a college graduate is filled with change — in a great way. 1. Join the Emory online community. "This summer the Emory Alumni Association is rolling out a new interactive online community for alumni members around the world," says Stacey Gall, alumni services manager, technology and engagement strategy. "You'll register your home and business addresses and update your contact information for the alumni directory. "Once you've shared your information, you can search for classmates, alumni and friends, find your alumni chapter or affinity group, select events in your area and around the world, register for alumni email, and so much more," she notes. 2. Tell us where you're headed. "We want to keep in touch with you. Tell us if you'll be embarking on a new career, if you're on the path to grad school, or if you're pursuing a service opportunity," says Jennifer Crabb Kyles 98OX 00C, senior director of alumni relations. "We will tailor communications to your destination city and introduce you to your new Emory alumni chapter." 3. Make career contacts and enhance your skills. "Be sure to join the Emory Alumni Association LinkedIn group," says Carolyn Bregman 82L, senior director of alumni relations. "With more than 21,000 active members, the Emory Alumni LinkedIn group is an unparalleled resource for making professional connections, sharing industry news, and searching for new career opportunities. "Once a month, listen in to streaming Coach Chats on professional development topics, or listen to podcasts of past programs. Once you are established, volunteer to be a career contact for a current student or other alumni." 4. Be social and keep in touch. "If you're leaving campus, the best way to keep in touch with your classmates is to connect with the Emory Alumni Association through social media. Follow @AlwaysEmory on Twitter to get a behind-the-scenes look at the work days of CEOs, artists, entrepreneurs and others," says Tania Dowdy 08OX 10C. "Follow us on Twitter and Instagram, like us on Facebook, get in touch with interesting alumni through our YouTube and iTunes playlists." 5. Plan your volunteer and social activities by joining an affinity group or chapter. "With more than 55 chapters and affinity groups around the world, no matter where you live or work you can always stay in touch with Emory," says Maura Klein 08OX 10C, assistant director of regional volunteer programs. "Check the event calendar regularly and plan to join your fellow alumni and friends at happy hours, faculty lectures, signature programs, sporting events, theater trips and so much more. And each November, get involved by starting or joining a project to improve our local communities on the Emory Cares International Service Day." "As an alumnus or alumna, you're invited to participate year round in virtual and in-person events," says Carol So 10C, assistant director of student and alumni programs. "Leverage the power of the Emory network and tap into the resources and expertise of more than 133,000 alumni around the world." To learn more about the full range of benefits and services available to Emory graduates, visit www.alumni.emory.edu.